In the last entry we started a mini-series on Florida with photos taken last February. In addition to the Orange Blossom Cannonball (which was covered in the last installment), my other primary Florida goal was to shoot the South Central Florida Express, a subsidiary of U.S. Sugar Corp. and the last true sugar cane railroad in the United States. An attempt to shoot it a few years ago in March got us to the railroad just a couple of days after the cane season ended. This time we were there in February. South Central Florida Express hauls sugar-related products to the outside world from the mill in Clewiston on two different lines. Heading northwest is the connection with CSX Transportation in Sebring, about 70 miles away. Heading mostly east is a connection with the Florida East Coast at Fort Pierce, maybe a distance of 50 miles. Both lines feature nice bridges. However, after two visits I have not been able to get a decent shot of the swing bridge at Moore Haven on the line to Sebring (it seems to be a cloud magnet). The wonderful old lift bridge on the line to Fort Pierce, however, at Port Mayaca proved to be an easier target, and we got a train heading towards Clewiston at the bridge on February 11 (right). The line to Fort Pierce also has a nice deck concrete bridge at Port St. Lucie, about 13 miles out of Fort Pierce. We were able to catch trains here twice in good light, such as this one on February 13. Only one locomotive was needed for the short train however; usually two locomotives lead a much longer train. We'll see why this train was short in just a minute. With an early February visit, we'd be guaranteed to find trains working the mill and hauling cane back from the fields. 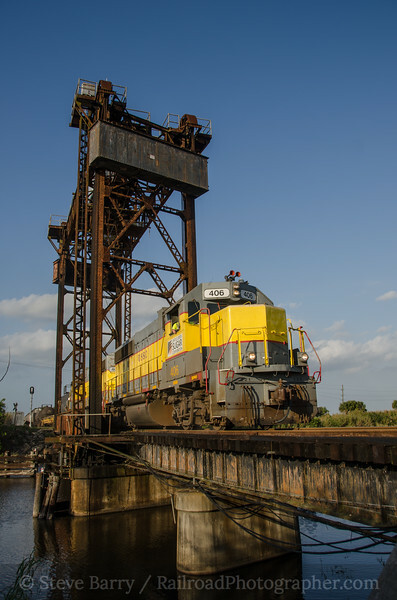 There were also frequent trains scheduled to come in from the former mill site at Belle Glade. However, on the first morning of our visit the mill at Clewiston had a major steam line rupture. This would shut the mill down for four days (much longer than our visit); since cane is highly perishable, no cane would be cut in the fields. And no cane meant no cane trains. We were fortunate to see the last train come in from Belle Glade right after the rupture; this train was already on the road when the rupture occurred and most of the cane it had would ultimately go to waste. With no processed sugar heading out of the mill, the interchange trains to CSX and FEC would be running short -- thus, the short train we saw at Port St. Lucie. The tracks near the mill in Clewiston, by the way are operated as U.S. Sugar Corp., while the tracks heading to the interchanges are operated by subsidiary South Central Florida Express. USSC owns all the locomotives. With not much running except the interchange trains, we chased them around. The train we shot at Port Mayaca paused to do some work between Lake Harbor and South Bay. 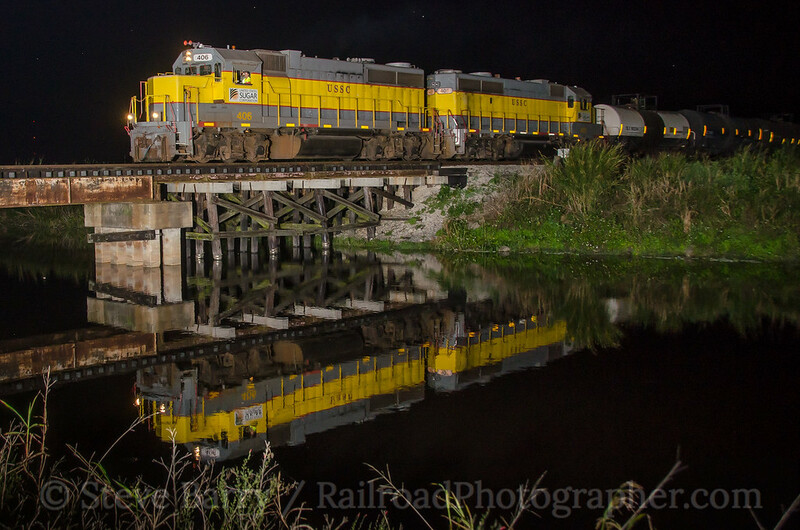 We set up for night photos at the Miami Canal bridge, but as dusk approached the train stopped working. It just sat there with its lights on. Not ones to give up easily, we kept an eye on the train and about two hours later a crew van pulled up; shortly thereafter the train began shuffling back and forth once more. 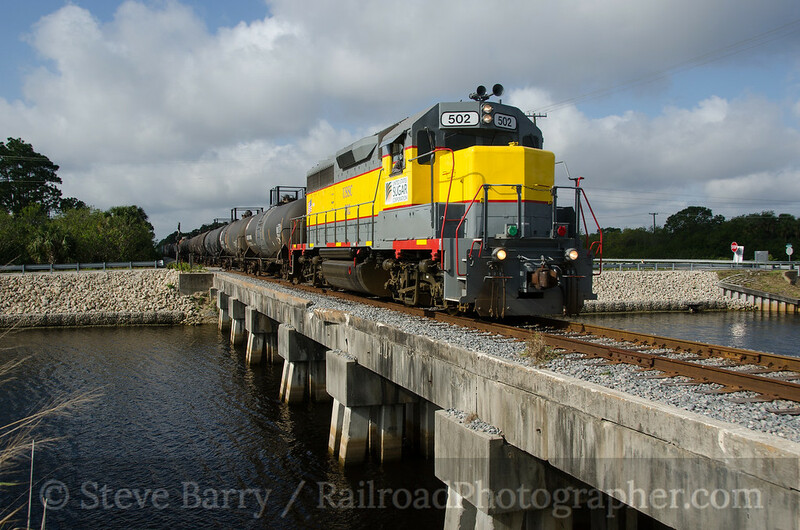 Finally, after a far too long wait, the train came west to finish its run to Clewiston. So what does this mean? Hopefully, third time will be a charm. 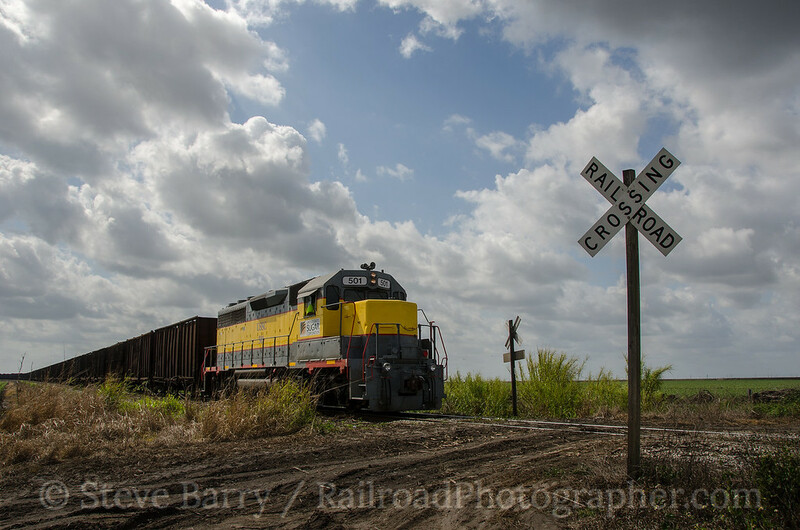 We'll be back to Clewiston at some point this winter to finally see the last cane trains in the U.S. working the fields. Random Ramblings -- I Hate Cords!